Prepare for the flea apocolypse. An effective cat flea treatment needs to be carried out on multiple fronts. In three simple steps, you can eliminate fleas from your home for good. Cat fleas can make your pet very uncomfortable, but these little insects are also extremely prolific. A female cat flea can leap over 100 times its height and will also lay approximately 20,000 eggs within three months. Moreover, cat fleas bite both pets and humans. Fleas can transmit parasites such as tapeworms, not to mention numerous diseases. Pet owners often forget that the Bubonic plague of the early 14th century was brought about not just by rats but by the bacillus-carrying fleas that sat atop these rats. Fleas are not pleasant, and they are certainly not safe little pals to host on your cats and carpets. What does this mean for you and your pet? It means that immediate action is imperative in order to prevent a serious flea infestation. First, you need to treat your cat. Cats are highly sensitive to chemicals, so products you would use on a dog are usually not suitable for cats. The absolute safest way to remove fleas from a feline is to use a flea comb. This is a special fine-toothed comb that literally pulls fleas out of the fur. Keep an alcohol wipe handy so you can quickly kill each flea as it is removed. There are also herbal cat flea collars that may be effective to some degree, and you can try one out on your cat to see if it keeps the fleas away between comb throughs. If your cat is heavily infested with fleas, you may need to consider using a commercial flea treatment. Your best bet is to contact your veterinarian for an effective flea removal solution that is safe for use on felines. Second, you must clean your house from top to bottom. 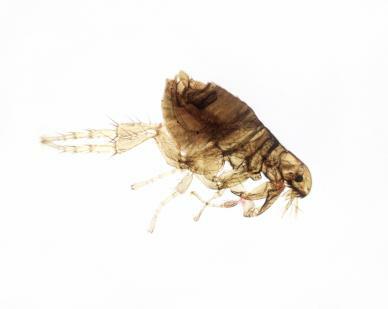 Cat fleas drop their eggs on carpets, bedding, rugs, etc. So, you will need to vacuum your home thoroughly and wash any bedding or rugs that could be hosting the fleas. Treating your cat while ignoring this vital cleaning step will result in your cat's re-infestation over a period of days. Third, you will want to hire an exterminator to de-flea your outdoor area, and you need to make sure that the product used is not toxic to cats if you plan to let your pet go outside. You can ask about environmentally-friendly chemical alternatives as well, but at the end of the day, you want to ensure that the extermination will be effective. Don't forget that it takes about two weeks for flea eggs to hatch. So two weeks post extermination, you'll want to bring out the chemicals once more to kill off the recent hatchlings before they are old enough to breed. You will also need to vacuum and wash your carpets and household items once again to ensure that the fleas have no place to hide and breed. Outdoor cats are privy to a horde of environmental pests. They suffer a higher incidence of injury, infestation and disease. For these key reasons, many breeders will not sell kittens to homes that support the outdoor adventures of domestic felines. If you never again want to find yourself seeking out a cat flea treatment, your first step is to keep your cat safely indoors. Instead of paying for regular toxic exterminations that can aggravate both your health and your kitty's health over time, you can invest in play items such as cat towers and kitty gyms that will keep your frolicking kitty busy. An adjustment period may be necessary for cats that were previously outdoor animals, so there may be some howling threats being echoed under your door during the night. You will win this fight eventually, and your flea-free kitty will enjoy a less itchy life, particularly during the warmer seasons.